A few weeks back I was birding at one of my usual Orange County haunts, Huntington Central Library. I wasn't carrying my camera as I wanted to focus that morning on birding, something I sometimes find difficult with camera in hand. Anyway, I hadn't birded the park in a while, and as such I didn't realize that the once-lake in park's center had during the hot summer months evaporated to nothing more than a large, muddy puddle. 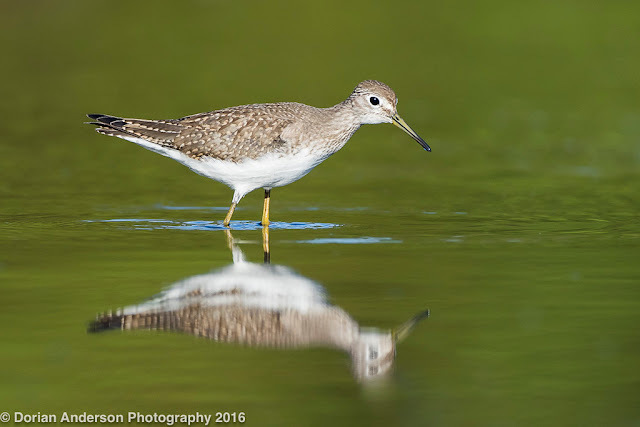 In that habitat, I immediately and appropriately spotted 2 Solitary Sandpipers, a mildly notable species anywhere in the generally arid confines of Southern California. The two birds were relatively approachable, and I kicked myself for leaving my camera in the car (Murphy's Law, right? Wonder if the same guy discovered Murphy's Petrel?!?!?). The sun was already above where I'd ideally like it to be for morning shooting, so I formulated a plan to return to the area later in the afternoon with the hope that the birds would stick around despite sure and constant disturbance from people and dogs at the heavily used park. OK, fast forward 6 hours. I returned to the park to find that the sandpipers were still present. This was the scene, looking east. The sun was behind me, to the west. During my morning session, I noticed that the sandpipers favored the western edge of the habitat, the edge just on front of me in this late-afternoon photo. I staked out a position in the reeds just adjacent to this section of the mud hole. As per usual when photographing shorebirds, I got down on my stomach and waited for the birds to return to that favored area. Taking cover just off the path. I waited, and I waited some more. Then some extra-special bonus waiting. There was a fair amount of foot and dog traffic just behind my vantage during all this waiting, so the sandpipers stayed on the far shore where I couldn't photograph them as desired. Finally, after over an hour of waiting, one of the birds flew into the staked out area. There were loads of Mallards in that same corner so it was really tough to get an isolated shot of the sandpiper. Luckily, it found, for just a few moments, some clear space in between the ducks where I could get a shot of it without any duck photobombs. I had only a few seconds before another person came along and scared my subject away. Bummer, but I was able to walk out with that I consider to be a serviceable frame of the bird! I think this example helps to illustrate two suggested points with respect to bird photography. First, many birds are creatures of habit, even non-resident migrants like this Solitary. As such there is often at least some degree of predictability to their behavior, particularly their foraging efforts. It is very possible to increase one's chances of obtaining a decent photograph by pausing to observe the sought bird or species before jumping headlong into photographing it. This is the planning half of the equation. Second, once a spot is selected, a commitment to it, even through a prolonged wait, can be fruitful. This is the patience stage. While I have captured some legitimately fortuitous frames over the years, most of my best shots have resulted from a combination of careful planning and exercised patience. Give it a shot. With enough practice, you too can use behavioral observation, proper planning, and patience to improve your bird photography. Post #75 - I FINALLY have a local patch! Wow - it has been a while since my last post! Things here have been very hectic between a near-move to San Francisco and the acquisition of Roody, our new rescue beagle. It has been a bit of an adjustment as we establish a routine, but we're getting there slowly. As our neighborhood is basically the epicenter of an endless concrete nightmare, we have struggled to find palatable places to exercise him (always on leash, of course! ), particularly within walking distance of our apartment. That being said, we have recently discovered what is fast becoming my new local patch just a short car ride away. I/we can't make it there everyday, but it looks as though once or twice a week might be feasible given my ~9-hour work day and 2.25-hour round-trip commute. Here are a few arial and "in-habitat" photographs to set the stage for you. Greater Los Angeles Area - the red pin is our apartment. Medium view of my circumstances. Wilderness Park is my new spot. San Gabriel Wilderness Park - nothing wild about it. Dry wash to west/left is San Gabriel "River". 605 Freeway is one of the nation's busiest. The park and one of its two water features. Resident American Wigeon in foreground. Ok, all complaining aside, I have had a really fun time walking Roody around this patch park. It's usually fairly well-populated, but always holds at least a few birds. I have now visited half a dozen times, and each visit has produced new species for my running park list. Given my unabashed eBird addiction, its no wonder that I have pulled a few screen shots from the site to graphically illustrate my experiences at the park. 6 of them are mine. Birding at the park has picked up in the 6 weeks or so since my first visit. Migrants such as Wilson's Warbler have just appeared, and today featured a surprising 5 species of raptors: Red-tailed Hawk, Red-shouldered Hawk, Cooper's Hawk, Osprey, and Peregrine Falcon. Shockingly, this was the first time either Osprey or Peregrine Falcon has been reported in the park. I have now added 5 species to the cumulative park list since I started birding it, and I fully expect my personal total to rise as the more productive winter months arrive. It's FAR from the world's most glamorous birding, but its a project on which I can work moving forward. As work and constant f! @#$%^&*ing traffic prevent anything more than this on weekdays, this spot will give me at least something local to do on those days when I can make it home before nightfall. I am really hoping to find something good so that I can share it with LA birding community! Introducing Roody the rescue beagle! He's ~6-7 and very friendly and playful.